One of the key realities of Christianity is belonging. I belong! I belong to God. I belong to Jesus. 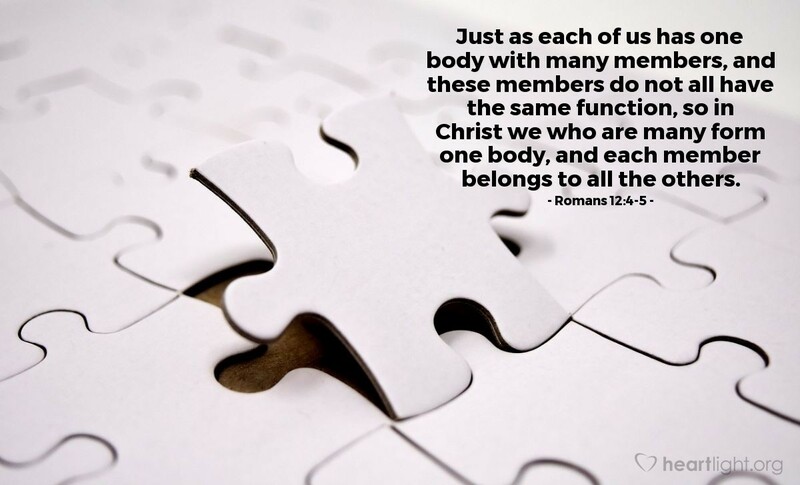 I belong to Jesus' body, the Church. I have a place and a purpose in that body. I belong! I am needed! I have a job to do! I belong!! Help me, Father, to find the place where you made me to fit into Jesus' body, the church. Until I know my exact place to serve and use my gifts, I pledge to work in all sorts of ministries so that your Spirit, and not just my own preference, will guide me into your place for me to serve. Thank you for giving me a place not only to belong, but to also serve and be a part of Jesus' bodily presence in the world. In Jesus' name I pray. Amen.